For anyone looking to create a useful, lasting history of your family: This is a book that should adorn the library or bookshelves of all genealogists Whether you're an amateur or professional, chances are the ultimate goal of your research is to produce a quality family history. 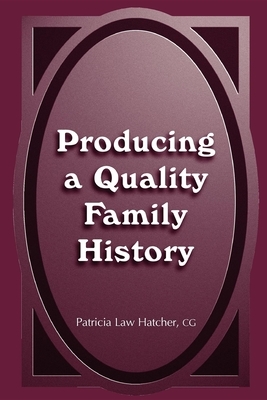 Producing A Quality Family History, by Patricia Law Hatcher, guides you through the steps required to create an attractive--and functional--family history report. Learn how to organize your work, how to write the narrative, choose type faces, grammar styles, and punctuation. You'll also see how to create useful bibliographies and discover ways to incorporate photos and illustrations effectively plus much, much more.